D has the world's most non-existent sweet tooth. He never craves sweets, he doesn't care for cake and he'll walk past cookies. I can't imagine how he manages. He does, however, love anything to do with key limes. And his requests for dessert are so few and far between that when he asked me to make the key lime meringue tart from the latest issue of Bon Appetit, I agreed immediately. And then I read the recipe. Ouch. It takes up a whole page and involves the use of a double boiler, a candy thermometer and a fine mesh strainer. Signs that a recipe might be a bit more involved than I need it to be on a Sunday afternoon. I persevered. It really wasn't difficult - it just required that I actually pay attention to what I'm doing. I made a simple change with the tart crust and pulsed the cold butter and cream cheese in the food processor with the flour instead of using the mixer. 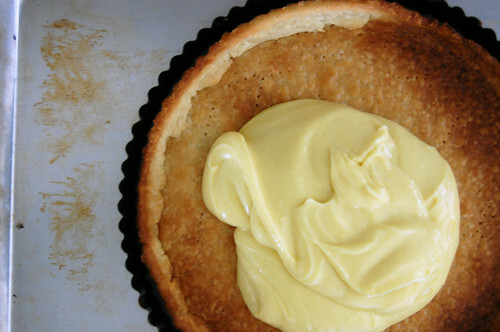 Because it is tart crust heresy to cream your butter and I couldn't bring myself to do it, even though that was what the recipe said. I browned the meringue in the broiler because I don't own a kitchen torch. It worked a bit too well on the first try and I had to scrape the blackened meringue off and put a new layer on and try again (do not leave the kitchen, even for a second, if you have meringue in your broiler - that is my advice). It was delicious, but quite a bit of work - I recommend it if you are feeling relaxed and want to spend a bit of time in the kitchen. I can't bring myself to re-type the recipe, but you can find it in it's entirety here. ah! a man after my own heart. i adore anything lemon or key lime. naturally, my fiance can't stand it, claiming it's too "sour". he prefers chocolate upon chocolate. i may have to make this just for me?! That looks delicious, and yeah, the idea of "beating" any ingredients in a tart crust makes me cringe. I wouldn't have done it either. This looks delish! Putting it on the to-make list. 'not burned, just shadowy.' that's great! mmm.. the limey filling looks splendid. thanks for warning us about the need to think through this one. glad it ended up being delicious! I'm so impressed! What we do for the ones we love! i'm impressed...anytime i read a recipe that is even slightly longer than i'm used to, i flip the page. this looks worth it though! Wow that sounds like a lot of work! I'm very impressed. I love anything Key Lime. this looks so yummy and springy.....I wish I had a piece right now! Yum! Citrus desserts are my favourite! D almost barely deserves to live in your household. just sayin. but i want that pie NOW. yum.